Okay, maybe summer has just ended up, but we still can adventure everywhere any time we want. I just felt to myself that it's been boring these days and maybe, its not bad to go on some relaxing places and enjoy the breezes and here in Philippines its a worth-it travel to go, I swear. Since I'm living here, I will show you the beauty of my country. I've seen some of the beautiful-tourist-spot places and these are the ones I liked most. 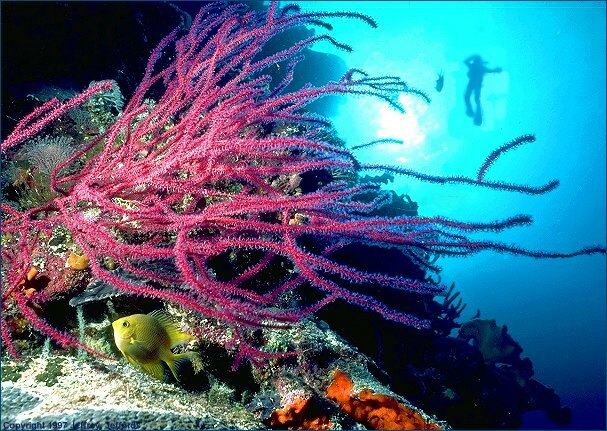 So, if you are tired of seeing beautiful landforms, you should visit this colorful stress-free Tubbataha Reef. . The reef is made up of two atolls, North Atoll and South Atoll, separated by a deep channel of approximately 5 miles (8 km) wide. It has become one of the most popular dive sites in the Philippines because of its coral walls where the shallow coral reef abruptly ends giving way to great depths. I've been to many beaches in our country and I've seen a lot of resorts within South East Asia, but nothing compares to Boracay. It's still the best beach in Asia and a Philippine gem that needs to be maintained. Haven't seen the beautiful rice terraces yet. This looks like a great place to visit. It is on my bucket list now thank you for sharing. I would love to paddle through that underground river-it looks magnificent. There are certainly some beautiful spots in the Philippines. Can you camp it out? I never really paid much attention to the Phillippines until I started blogging and seeing so many blogs about it. I would really love to visit it as it sounds amazing. Thank you for sharing. I am encountering more and more people from the Philippines via social media. The photos you shared here are so beautiful. I am glad I got to see them. Those are some of the wonders in the Philippines. I only been to "Boracay" wish I can visit the rest of the beautiful places in our own country in the future. Totally more fun in the Philippines. You made me miss every bit of our country with all these pictures. These are places I so want to visit the next time makauwi kami nang Pinas. I haven't been to the Rice Terraces and I have always want to go. Beautiful photos of the Philippines to be proud of.